First came the 1952 novelette of “The Birds” by Daphne du Maurier as a metaphor for aerial attacks on England in WWII. Alfred Hitchcock’s iconic 1963 film has given viewers nightmares for years. Then, in 2009 Conor McPherson adapted the story for the stage. Each artist crafted the narrative in very different ways, but the story of nature against humankind remains the focus. Now, at the St. Germain Stage, you don’t have to wait more than three minutes to start feeling the creepy sensation of birds ready to attack. I confess to being a fan of McPherson’s work, and “The Birds” has many of his typical themes; morality, tension, sexual threat, and religious imagery, but this play is less cerebral than most of his others. Still, in the hands of Director Julianne Boyd, this production will have you at the edge of your seat and will make you think about what the world could become. Barrington Stage’s production of “The Birds” takes place in dystopian New England after the world has “shifted course” and the birds literally come in and go out with the tide. When they’re in—the few remaining survivors take cover for safety. Three people find themselves taking refuge in a claustrophobic cabin and have to confront survival as they search for food and come to terms with their own demons as they attempt to negotiate their own emerging relationships. 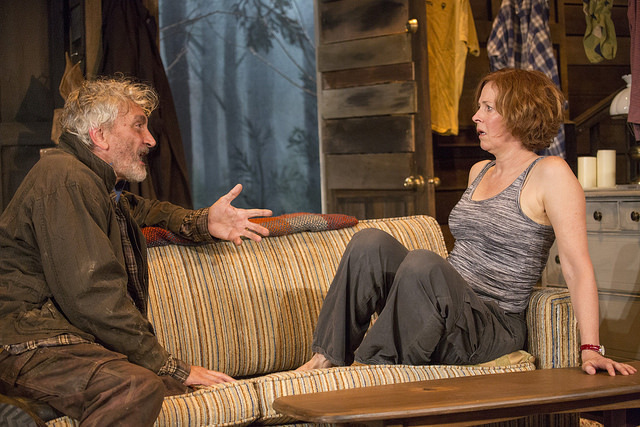 Much of the tension in the play is the result of Alex Basco Koch’s earie projections of birds surrounding the cabin, and David Thomas’s exceptional sound design that places the audience in the center of the bird attacks. The cast is strong and believable, but the entrance of Rocco Sisto as Tierney, a drug-addled farmer who lives across the lake, is particularly bone chilling, letting the audience know that the threat inside the cabin is imminent. When he says; “No one ever thought nature was just going to eat us,” McPherson’s message comes through clearly. McPherson’s adaptation of the story could easily be seen as a metaphor for global climate change and the message of Darwinian principles of survival are juxtaposed with a verse from the Bible, but what I found most impressive was the way in which the Barrington cast and production team used the small theatre for maximum impact.